Over the years we've seen a lot of gadgets that promise to enable us to view content from our laptops or PCs on our big screen TVs without the need for wires. While they promise much, unfortunately the reality is often poor video quality plagued by lag. Can the HP Wireless TV Connect Kit do any better? 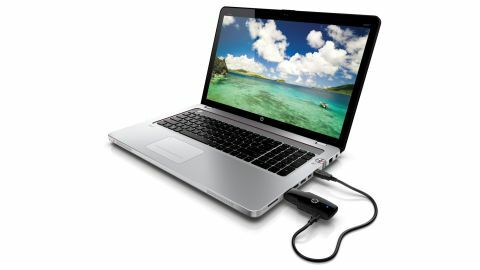 It comes in two parts - one that plugs into your laptop's HDMI port and is powered by the laptop's USB port, and a small receiver box that plugs into a power socket and connects to your TV via an included HDMI cable. Setting up the kit is pretty easy, but we quickly hit a snag - the HDMI port of our laptop was too far away from a USB port for the included wire to reach. Luckily we had a USB extender to hand - but if you're not so lucky, it could prove very annoying. The good news is that apart from that small niggle, performance was really good, with virtually no lag at all. Occasional graphical artefacts were evident every so often, but on the whole, image quality was excellent, especially when watching movies. The fact that the HP Wireless TV Connect supports 7.1 sound and 3D content is also very good - but there's no denying it also comes with a high price tag. Also a word of warning - both the receiver box and the adaptor run very hot after being plugged in for a while, so make sure they are well ventilated.